﻿Prescribed burning turns watermelon patch into award-winning property. ﻿﻿﻿﻿﻿﻿﻿﻿﻿Simon Winston starts his pickup, and the country-and-western channel on his satellite radio kicks on with the late, deep-voiced Johnny Cash singing his classic Ring of Fire. These days, the only watermelon to be found on the Winston 8 farm comes from a grocery store. 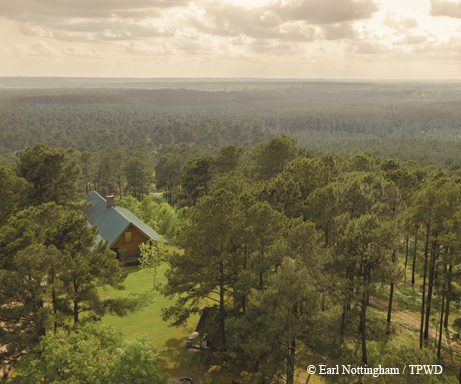 What the Winstons have done with their property, one of the larger privately owned pieces of land in this part of East Texas, earned them the 2014 Leopold Conservation Award, the state’s highest honor for private land conservation efforts. Given in honor of renowned conservationist Aldo Leopold, the prestigious award is conferred each year by the Sand County Foundation, a nonprofit organization devoted to private land conservation, in partnership with the Texas Parks and Wildlife Department as part of its Lone Star Land Steward Awards program. In Texas, the Leopold Conservation Award program is sponsored by the Lynde and Harry Bradley Foundation, the Lee and Ramona Bass Foundation, DuPont Pioneer, Farm Credit and the Mosaic Company. Virginia H. Winston accepted the Leopold crystal award and a check for $10,000 at the annual Lone Star Land Steward Awards dinner in Austin last spring. The Winston 8, while sometimes called a ranch, is not a typical Texas spread. It has grass — native bluestem — but no cattle are growing fat on that grass. “Tree farm and wildlife preserve” would be a more appropriate moniker. When the late John Winston and his wife acquired the acreage in the 1970s, they began reforesting it. 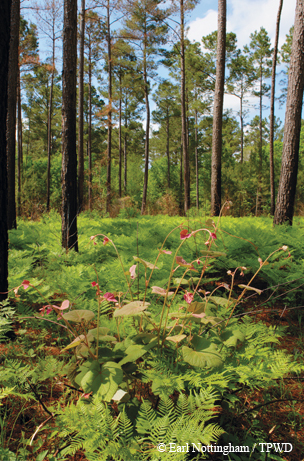 Today, the place is a verdant blend of loblolly pine with a growing number of longleaf pines. The Winstons kept some of the land clear — planted with native grass — to provide cover for a resurging population of bobwhite quail and Eastern wild turkeys. Wetlands provide habitat for migratory waterfowl. Most of the Winston 8 and probably 99 percent of the rest of the timbered land in East Texas are covered with loblolly pine. But that’s not the way it used to be. But longleaf grows straighter and is generally acknowledged as a better variety of pine. And unlike loblolly, it won’t be killed by surgical, prescribed burning. Because of that, the Winstons started planting longleafs. The Winston family was nominated for the Leopold Award by U.S. Fish and Wildlife Service biologist Jeffrey A. Reid. » Restoring 180 acres of native longleaf pine, thinning 700-plus acres of loblolly pine to promote forest health, and clearing and seeding 93 acres for native grass and forbs, as well as undertaking significant efforts to rid the ranch of invasive Chinese tallow trees. » Stocking 80 Eastern wild turkeys in 2007-08 and suspending turkey hunting on the property until the population expands and is sustainable beyond the boundaries of the ranch. Already, wild turkeys are frequently seen on the property. » Managing the ranch’s deer population to produce some trophy bucks. Additionally, 45 white-tailed does were released on the property to diversify the genetics of the deer herd on the ranch. Since the ranch is low-fenced, this also benefits the deer herd on surrounding properties. » Employing innovative wildlife management techniques, such as creating clear spaces on the ranch to increase usable habitat for wild turkey hens. These openings, in addition to all pipeline and power line openings, have been planted with native grasses. » Using the ranch for research, educational and life-enrichment purposes. In addition to often providing access to other private landowners, youth groups and physically challenged individuals, the property is routinely used by state and federal agencies as a demonstration area for southern pine beetle hazard reduction, prescribed burning, thinning, longleaf pine restoration and native grass and forb restoration. » Using prescribed burning to reduce the threat of wildfire. With input from the Texas Forest Service and TPWD, Winston does controlled burns in 5- to 30-acre chunks on a two- to three-year rotation. ﻿Simon Winston and his mother, Virginia, do a controlled burn. Winston tries to get his neighbors and other landowners in his part of the state interested in prescribed burning, but it’s been a hard sell. 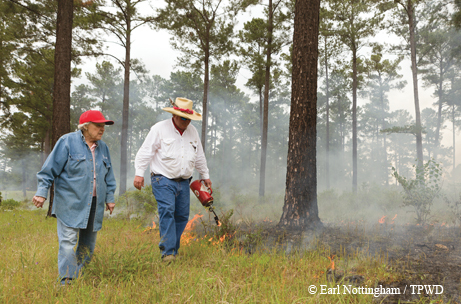 Actually, other East Texas landowners don’t have to go to Bastrop to see the benefits of prescribed burning and other conservation measures. All they have to do is visit the Winston 8. To nominate a landowner for a Lone Star Land Steward Award or to learn more about, go to www.tpwd.texas.gov/landsteward. Nominations are due by November 30.